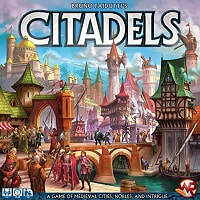 Citadels - Experience an immensely popular city-building card game in its original form! Citadels Classic brings you Bruno Faidutti’s game of card drafting and intrigue as it was first published by Fantasy Flight Games in 2002, with the characters as they were first visualized by Julien Delval. Featuring easy-to-learn rules and engaging social interactions, Citadels Classic is a perfect entry-level game for younger or less experienced gamers. This edition is both portable and affordable, enabling you to create the medieval cities of your dreams anywhere you want.